Elsie in our nauticus pleated dress. Jen in our brooklyn skyway ruffle blouse. Liz in our clarissa jazquard dress by BB Dakota. I love the brooklyn skyway ruffle blouse. There are so many ways you could wear it. It looks great dressed up, but I'm sure it would look just as cute if you went casual and chose pants. Posting something about how to wear color is a great idea. Especially with it being wintertime, I think people need inspiration and suggestions about how to wear color effectively. Winter shouldn't mean all neutrals, which I sometimes get stuck in. 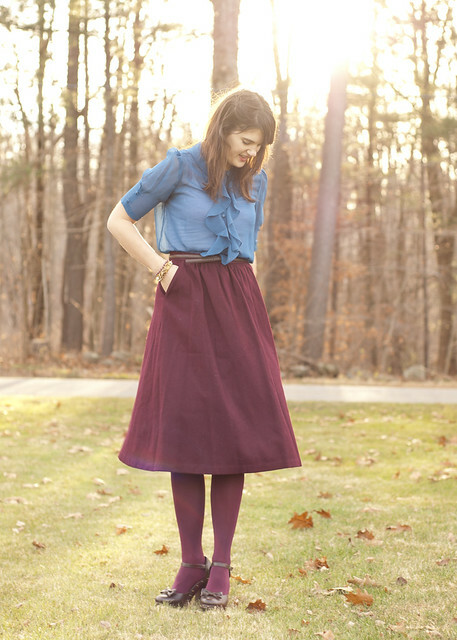 What beautiful inspiring ways to wear color! It's a scary struggle to pull off more then one or two colors in an outfit, but these girls did it wonderfully!